It’s been a year. A year of ups-and-downs. A year of fun. A year of confusion. A year of learning. A year full of making new friends. I maybe a few days late (okay, 24 days late), but I would like to celebrate a few things today. I would like to celebrate the birth of this blog, friendship, AND my college decision!! Just last year, I was sitting on my MacBook, chatting with my best friend, saying, “it seems like people find my recipe posts on my personal blog more interesting than posts about me commenting about my everyday life.” Suddenly, I had an epiphany! I wanted to create a food blog! “A blog about food,” I said to myself. I liked it. And that’s when it all grew from there… I Googled “food blogs”, tried to get an idea of what I was getting myself into, then, I decided to create a name for the blog (which was hell!). Creating a sophisticated name for a blog owned by a teenager was kind of pushing it. Being a male teen food blogger was also pushing it. I was now entering the territory of moms, chefs, and foodies who know just about everything and anything that has to do with food, writing, blogging, and photography. If I was going to make it in this community, I had to prove myself. I am not sure if I have exactly “proven myself” yet, but I have survived and I did manage to make many friends during this time. I have failed to mention my new camera on the site, due to the fact that I wanted to thank the person who GAVE me their camera (out of the kindness of their heart), by dedicating a post to them. That person, is Olga. One evening Olga Direct Messaged me on twitter, asking me if I wanted her other DSLR camera. I said, “Sure! How much?” That’s when Olga corrected my mistake. She said that she was giving the camera to me for free! Yes, free! Who knew that in a world full of war, hate, maltreatment, and confusion, a person could act so kindly to a teen who only dreamed that he would get something he began wanting since… The day he began taking photos. Who knew that dreams really do come true? Well, now I do! Olga, I thank you from the bottom of my heart! I cannot express in words, how appreciative I am of your kind gift. And Happy Belated Birthday, friend! Here’s to many more years of great food, great writing, and great friends! To celebrate Olga’s birthday, our blog birthday, and my college decision, I’ve decided to break tradition and share a pancake recipe (instead of a cake recipe) that I’ve had a penchant for making over the past several weekends. It’s an old-fashioned banana pancake recipe that will have you drooling after your first bite. Pancakes are technically cake, after all! Right? OF COURSE! 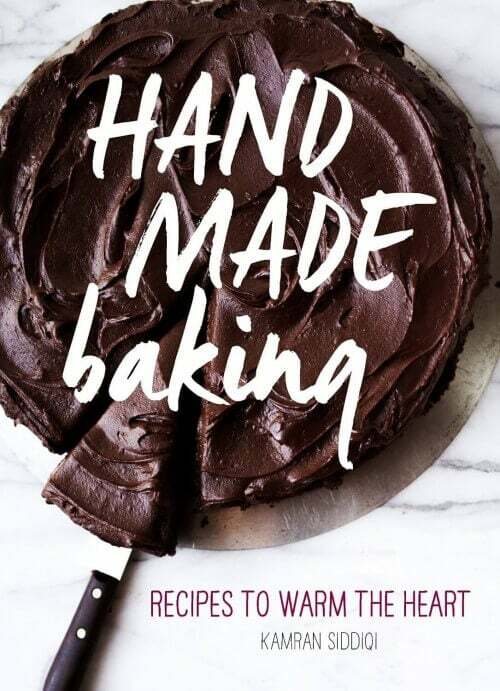 After seeing this pancakes recipe in the Mad Hungry Cookbook, I had to ask Lucinda Scala Quinn, the author of the amazing cookbook, if I could post an adapted version of the recipe. So, with her permission, here it is. Thanks Lucinda! 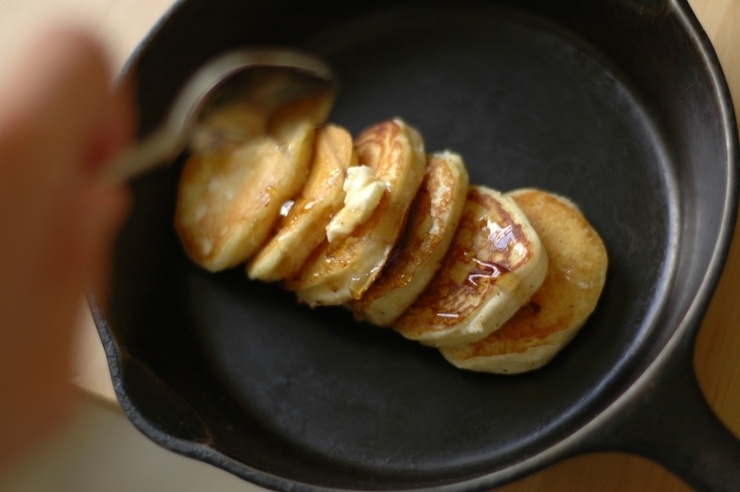 This simple and basic old-fashioned banana pancakes recipe puts boxed pancake mixes (blech!) to shame. Just put everything together and mix! Lucinda Scala Quinn’s basic old-fashioned pancake recipe results in delicious, slightly thick pancakes, that require little to no effort to make. In a large bowl, whisk together the flour, sugar, salt, baking powder, and cinnamon. Make a well in the center of the flour mixture. Add in the egg, milk, and 2 tablespoons of the butter. 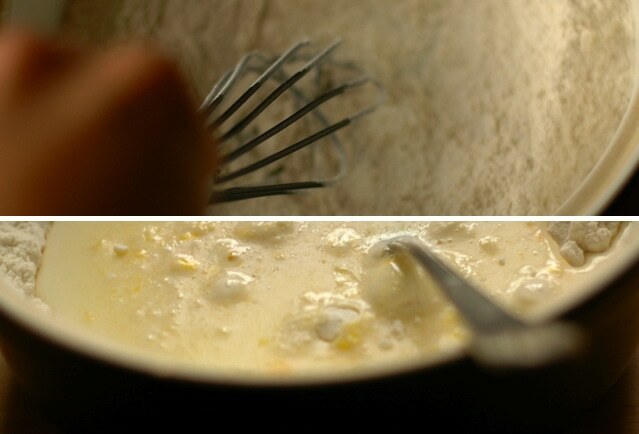 Whisk from the center, slowly incorporating the flour. Mix in the mashed banana(s). Rest the batter for 10 minutes. Heat a large well-seasoned cast-iron skillet, non-stick skillet, or favorite griddle over medium-high heat. Swirl the remaining tablespoon of butter in the skillet (or use oil to coat the griddle) and immediately pour in 1/4 cup of batter for each pancake. When the bubbles rise to the surface, flip the pancakes, slightly reduce the heat (kamran note: skipping this step doesn’t really change the outcome of the pancakes), and cook until the bottoms are golden and the centers are cooked, about 1-minute (Rarely does the first pancake work well- it takes a bit of time to get in the groove with the heat, fat, and batter). As the pancakes come out of the skillet, place them on the warm platter in the oven until ready to serve. Serve a stack of pancakes, topped with more butter and the maple syrup. – Fold in ¾ cup of berries. Blueberries are especially good with banana batter. – Sauté thinly peeled, cored, and sliced apples in a little butter with a dash of cinnamon. Spoon onto the uncooked side of the pancakes before flipping. – Replace half of the all-purpose flour with whole-wheat, buckwheat, or rye flour. – Toast pecans or walnuts, chop, and fold them into the batter. Slice fruit on top of the pancake before flipping. So, so, so happy for you! What a time in your life this has been. Congratulations on your college choice, and Thank you to Olga for being so generous! I guess what goes around comes around, eh, Kamran? Congrats on your decision, Kamran! SHU is lucky to have you. And I had no idea Olga gave you your DSLR. She is one of the most generous, kind, and loving people I know. Congratulations on all of your success! You are truly amazing on so many levels. Best of luck at Seton Hall! I am excited for you, college is a fun time. This is proof that there are still amazing, thoughtful, kind and generous people in our world. What an amazing thing for Olga to do! Congratulations on your college choice…you’ll do BIG things my friend! A big congratulations to you! I look forward to seeing where life takes you. Olga sounds like a sweetheart and those are few and far between. Kamran, I can’t wait to see where you are going in life. Good luck in college! That’s great, Kamran! I’m so happy for you, and SO glad you have such a kind, generous friend in Olga. :-) Happy picture taking!! Kam, I’ll likely say this again tomorrow, but Congrats :). A year goes so fast, and more of them will pile up before either of us will realize. Not to mention the absolute wonderful generosity of food bloggers. I haven’t had the opportunity of meeting Olga, but I am headed over to her site the moment I’m finished this. You are going to do wonderful things, both here, at Seton Hall and far into the future in places that have yet to be thought of (or, have been only imagined ;D). Congratulations! College was such an epic time for me; full of growth, maturity, and amazing experiences. Enjoy it! And Olga sounds lovely! I have also made my university choice, but it will depend of my mark if I can attend it or not (and I need a very high one! :S). oh wow. lovely Olga, but you deserve it. all the best for college. Congrats Kamran on all 3! Your life is how you make it, so you deserve all good things coming to you. Banana makes anything yummy, have to try this recipe. Great to see you using your cast iron skillet, aren’t they just the best? Congratulations on a year of wonderful blogging, making such dear new friends and choosing your school! I love pancakes and can’t think of a better way to celebrate such good fortune, your own and ours, for being able to share in these events and fantastic food with you! Congratulations! Your tribute to Olga (who sounds like such a doll!) was perfect! CONGRATS! I’m so excited to watch you as you take this next big step. I loved my college experience! What a sweet sweet person Olga is. I am excited to see all the gorgeous photography I know we’ll be seeing from you! anyways, congratulations on your decision.. i know how difficult it is to make a decision especially choosing from many good schools… good luck i am pretty sure you’ll do well..
Ah Kamran…so many of us have been reading/watching/admiring this year knowing that you were bound for BIG things, and I think this college decision is proof of that. I’m so happy for you, and excited to see what you have in store in the coming months/seasons/years. As I’ve told you in the past…from an English teacher, you’re a rare exception to the “norm.” Congrats 10 times over. Congratulations, my smart, talented, sophisticated young blogger! College is awesome. I’m glad you took precautions NOT to let anyone make the decision for you…you’ll have the time of your life for sure! And OMG! Olga is SO generous! She’s like the food blogger’s fairy godmother! Wow, you are one lucky guy! Lovely to see that there are still some genuine people left. And all the best for college – I’m sure you’ll make a success of it. Kamran – your passion and drive are the reasons I thought you were the perfect recipient for the camera! I’m so glad we were able to “meet” and I could give you something that has served me so well and you needed and wanted. I cannot wait to see the pictures you take – and enjoy the learning process – that’s exactly the objective. Thank you for your post – I just teared up and now have to go and fix my mascara :-) before work. Now, go and take more pictures!! Congrats and I hope that you will find a way to keep blogging as you move into this next, exciting part of your life. This is such a sweet, personal post. You amaze me every day with your cooking, your writing, your wise ways. It’s no wonder that people are so drawn to you and want to help you with all your pursuits. Seton Hall better get ready because you’re going to show them a thing or two!! They’ll be known for basketball AND blogging! COngrats Kamran – you deserve all the great things coming down the pipeline. Looking forward to see how you watch and grow over the years to come! Congratulations on your decision to attend Seton Hall! It’s a fantastic university with a wonderful reputation. They’re lucky to have you! And thanks to kind Olga for fulfilling that long-held desire for a DSLR. Wow, that was so kind of her! side note: kamran, your site is looking better than ever. gorgeous design. Congratulations! I have no doubt you’re going to enjoy college and be a great student. Congratulations, and all best wishes for college. I am sure it will be wonderful for you. That Olga is a sweetheart, what kindness. Here’s to a great future, for you, your camera, and the blog. Watch out, SHU! Congrats, Kamran!!!! You’ve accomplished so much in the last year. Keep at it!!! No better way to commemorate such a great friendship than with a post! It’s really fitting. Congratulations on your decision, Kamran!!! you are thoughtful, smart, quick and most importantly full of spirit – enjoy the college venture and keep posting! I love to see what you are up to. Your pancakes look wonderful. Congrats on making your big college decision… I’m sure you will have an amazing time! 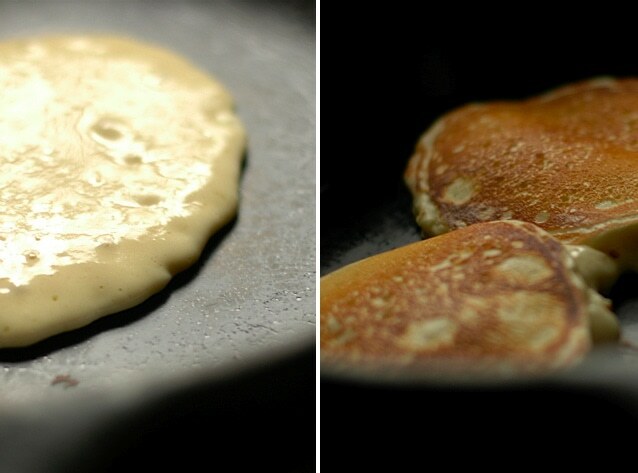 What great looking pancakes, and congrats on your new camera. I just trashed an old typewriter a few months ago, worked fine, I know you hate me now, LOL. I never knew anyone who thought they were cool, I’m too old. exciting! The first time I came to this site I was amazed that a 17 year old was writing it, very professional and yet has so much vibe. It is wonderful that you have met such kind people through your blog/twitter, such as Olga- Have fun with your new camera! I was touched to read about Olga, what a wonderful mentor!!! Love your blog & Good Luck with college!! Congrats on your college decision! I was going through all the same stuff four years ago, take your time and enjoy it as much as you can! Kamran, I am thrilled for you, for all your good news and for your new camera! All so well deserved. You have a very bright and wonderful future ahead of you. Keep up all your wonderful and inspiring work… And a belated happy birthday to boot! Congratulations, Kamran, on both your blog anniversary and your college decision. I have a feeling that your hard work, smarts, and talent are going to serve you very well in life. Love the first photo! I have no clue how I missed out on your blog all these days. Its magical and beautiful! I wish I had half your commitment. And congratulations on the college decision. I made a decision to go back to school myself and pretty kicked about it. That said, I need to learn too :) what is just right info and what is TMI! About the recipe itself, gimme bananas anyday with anything and I’m game! You chose well and good for you being so sure of yourself. I just tweeted for a recipe for banana bread as the black bananas sit staring at me. No one responded and then I opened your post (I know I’m behind). So tomorrow morning, it’s banana pancakes. Just in time. I made these this morning and served with a chocolate maple sauce. Big hit. I used two small seriously ripe bananas. My batter was much thicker than yours though and I’m wondering if you added in more milk? Wishing you all the best there is and everything you desire. All you need is to work at it and believe and things will work out. Wow. I found you via twitter yesterday… and am just now reading your beautiful blog. I’ve read many posts and I am entertained and impressed by your writing, and in awe of your fabulous photography. I find myself excited to read more, and feeling as if I found a great treasure, want to share this blog with everyone. Congrats on college – big decision. You have many wonderful experiences ahead, and I have a feeling you know that and will savor each one. Thank you for this blog; it is stunning in every way. Wow, someone gave new a camera. Bless Olga’s heart for her generosity. I know I’m a bit late but congratulations… I know you’ll be very well. thanx for the easy & tasty recipe!